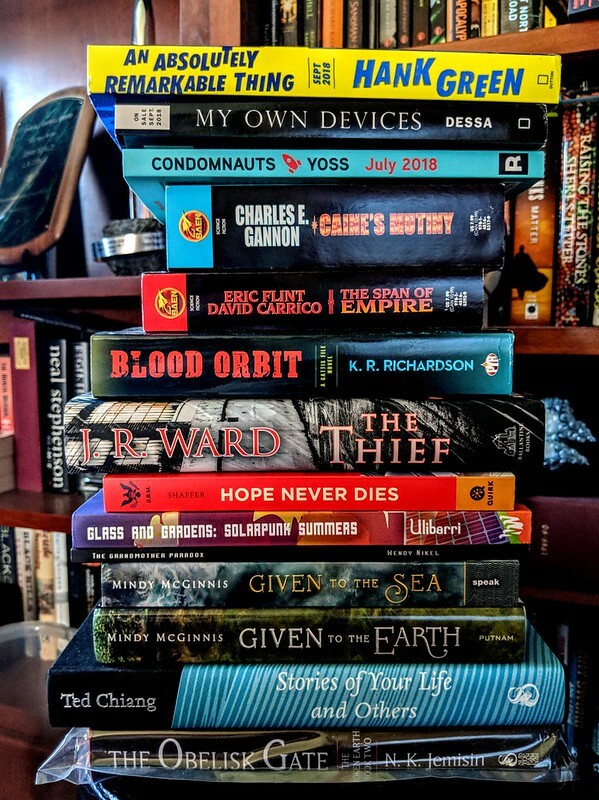 I’m catching up on quite a few new books and ARCs that arrived at the Scalzi Compound while I was on tour. Here’s the first batch for this week, and there are some gems. See anything you like? Tell us in the comments! Ted Chiang is a real treasure, and this Stories of Your Life looks like a lovely edition. BTW, it was great seeing you in DC last week! Obelisk Gate? Is it a special edition or something? That book’s been out for a couple years. Let’s find out what Kat’s doing! I’m definitely curious about An Absolutely Remarkable Thing. I’ve been following Hank for over a decade, but a novel is so different from anything he’s done before that I don’t really know what to expect. I’m dying to read Kat Richardson’s BLOOD ORBIT. !!! A new book by Yoss? Yes please! His stories are a treat, and the publisher, Restless Books, is top-notch. For those who don’t know, Ted Chiang’s Novella by the same name was the story behind the movie Arrival. Eagerly awaiting the early reviews for Mr. Green-the-younger’s book. I have it queued up on Audible ready to pull the trigger if I hear good or even less than bad things about it from reliable sources. Anything new in this edition of the Chiang, or is it just a reissue? The Chiang and Jemison are both Subterranean Press editions. Are they both signed? I’ve heard good things about Yoss’s book! I’m here for Dessa’s memoir. I learned about her on the Hamilton Mixtape and just dug the hell out of her music since. “Condomnauts?” Really? Is this an adventure about where everyone has gone before? I love Chiang and Jemisin, and I’m looking forward to Hank Green’s book, but I cannot WAIT to read HOPE NEVER DIES, a buddy cop story starring Obama and Biden as a mystery-solving duo. The cover and the jacket copy are sublime. I like all the favourable comments about fiction reading, because that may encourage me to read more fiction too. Right now I’m more of a stick in the mud reading nonfiction. Wow, this stack has more in it that I want to read than I think I’ve ever seen before! Why is ‘The Obelisk Gate’ wrapped up like a convenience store nudie-mag?